Q. How much do you charge per square foot? We charge for our time by the hour, not by size. Pricing art glass by the square foot might seem logical but the size of art glass doesn't have much to do with the cost of making it. For any given size you can spend less or more, depending on the complexity of the design. When you commission us you're free to decide what you're comfortable spending and then we'll work with your budget to create beautiful, original art glass for you. Q. I found an image online of something I like, will you copy it? No. We respect the creativity and copyright of fellow artists so we won't copy someone else's work. We create unique and original artwork for each client. We do not use standard designs. If you've found something you like, we'll be happy to discuss your objectives and then design our own original art for you. If you admire historic art glass and would like something similar, we can easily create an authentic, similar composition. Q. Do you repair leaded windows on-site? Yes. We've been doing on-site leaded window repairs since 1982, providing repair services to more than 3,300 clients so far. Services range from replacing one piece of cracked, clear glass in a leaded window to full restoration of designated historic, Victorian-era stained glass windows. When obtaining quotes, be sure to compare 'apples with apples' - make sure everyone is offering the same scope of work. A low bid may reflect inexperience or poor quality craftsmanship. Likewise, be wary of claims that all types of repair and restoration can be done in your home. While basic repairs are routinely done on-site, restoring leaded windows is a comprehensive process which involves working with old lead, lead dust and lead fumes created by soldering. That's work best done in a properly equipped studio workshop, not your home. No. We think it's a really bad idea for several reasons, both practical and aesthetic. We'd be happy to discuss much better solutions for energy efficient installation. Stained glass does not need to be protected from the elements. It will easily last 100 years without covering. From a purely aesthetic point of view, the two glass surfaces of insulated units create undesirable, reflective glare - obscuring the beauty, texture and detail of stained glass inside. Most insulated glass warranties are only 10-20 years, some as short as 5 years. Insulated glass warranties rarely (if ever) cover the labour costs of replacement or risk of damage to the stained glass inside. All insulated glass units have seals that will eventually fail. When that happens, interior glass surfaces fog and can't be cleaned. Your beautiful stained glass window is now trapped between two layers of fogged glass. Someone will have to remove the insulated unit, break it apart - hopefully without damaging your stained glass - then send the fragile stained glass panel to a factory to be re-glazed (entirely at your risk by the way), then return to your home to re-install the insulated-stained glass 'sandwich' unit. Sound like a bad idea? We certainly think so. Leaded glass put inside insulated units can cause wide temperature variations within the unit, causing seal failure. Solar heat is absorbed by darker glass and lead, which damages lead by causing it to stretch, buckle and pull away from the glass sections. Stained glass is not repairable once put inside an insulated glass unit. If a piece of glass spontaneously cracks in your stained glass window (not common, but not unheard of) it can't be repaired because it's trapped inside the insulated glass unit. Likewise, if the leaded glass buckles due to trapped heat, it's not repairable. No. We maintain a modest profit margin to ensure our art is as affordable as possible and charge everyone the same reasonable, competitive hourly rate. We value our relationships with all clients equally so we don't artificially inflate prices just to be able to offer 'discounts' to some. Q. Do you pay 'finders fees' to designers who bring you clients? No. If your designer brings you to The Glass Studio it's because they respect our creative talents, service and the quality of our work - not because they're getting an under-the-table kickback or secret commission. It's simply not ethical to conceal hidden kickbacks (also known as 'referral fees' or 'lead fees'). In fact, most professional associations specifically prohibit their members from receiving undisclosed compensation or inducements for specifying work from a particular supplier. Q. Do you make lead-tape or "overlay" windows? No. We make real leaded windows only. Real leaded glass has been made for centuries - assembled from multiple pieces of glass, held together with lead or zinc channel (known as 'came'). Lead-tape windows are mass-produced, commercial products which imitate real leaded glass by applying adhesive lead-tape onto the surface of insulated glass. Sometimes coloured plastic films are used to simulate stained glass. Aside from the obvious visual differences, when the insulated seal of a lead-tape window fails, or it's glass is cracked, or the lead tape peels away from the glass, the entire window is junk. A real leaded glass or stained glass window is repairable indefinitely. Q. Do you restore antique stained glass windows? Yes. This is a tricky question however because the word ‘antique’ has different meanings. For glass artists the word ‘antique’ describes a centuries-old type of mouth-blown glass. We use ‘antique’ glass all the time to make brand new stained glass windows and restore old ones. Many people use the word ‘antique’ to describe an old artifact – an ‘antique’ chair for example. An ‘antique’ stained glass window might therefore be defined as something made in the Victorian era (1837-1901) or Edwardian era (1901-1910). 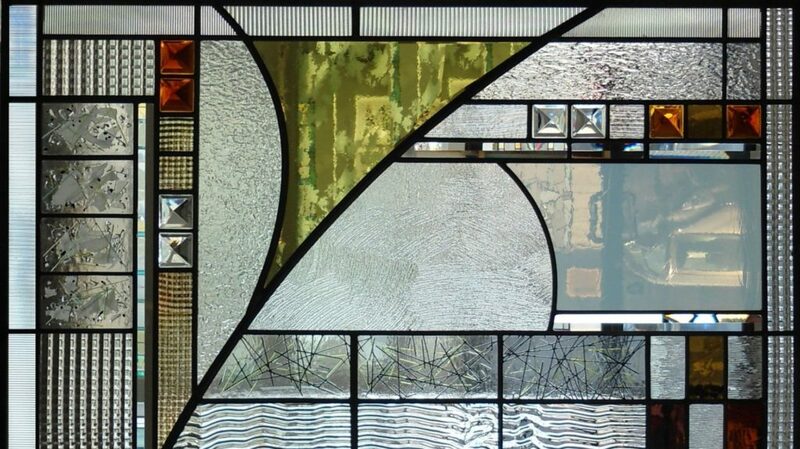 Click here to see examples of our antique stained glass window restoration. Q. Do you sell supplies, offer classes or cut glass to size? No. We don't offer classes, sell cut-to-size glass, craft materials or supplies. Just custom glass involving artwork or design.